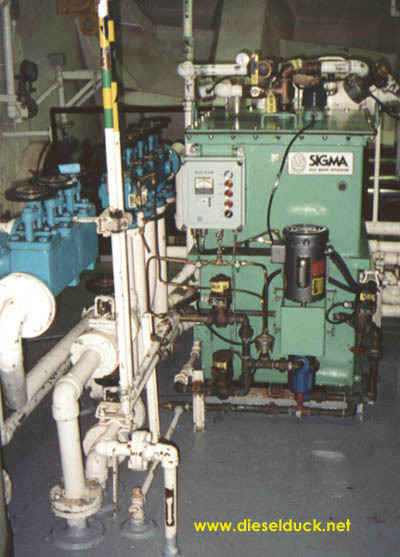 In regular operation, MarPol regulations require that all ship's machinery space bilge water must be disposed of either by pumping to an approved reception facilities ashore, or by pumping through an approved Oily Water Separator (OWS), the clean water overboard, and retaining the oil on board. Permission and guidance to discharge overboard should be sought from the Chief Engineer, or senior operational engineer, prior to starting. In flooding or emergency situations, you can "break" MarPol rules. At Sea, the OWS can be used while underway on a voyage, from one place to another. It cannot be used in port, at anchor, while drifting, or when the vessel is hove to or "Standing By". All activities relating to the OWS and the OCM (maintenance, testing, operation, certification, etc) must be recorded in the ship's official Oil Record Book (ORB) - in Canada, it's called the "Oil Record Book, Part I - Machinery Space Operations (All Ships)". Every attempt should be made to prevent any Chemicals that could cause an emulsion, such as detergents, surfactants, soaps, hand cleaners, etc. from getting into the Bilges. These will cause stable chemical emulsions to form which cannot be separated in the first, mechanical, stage of the OWS, and will rapidly block filters, if fitted. The OWS is not suitable for treating purifier sludge because of the large amount of solids suspended in the water; these will disperse light in the OCM unit, giving a false high oil content level indication and will quickly block additional filters. Chemical emulsions can be broken by dosing the bilge mixture with chemical emulsion splitters, such as Wilhelmsen�s Bilge water Flocculent . 15 ppm represents 3 tea spoons of oil in 1,000 litres of water, this level of oil cannot be seen, smelt, felt, or tasted, we depend entirely on the optical sensor in the 15 ppm unit to detect this. If the ship is in danger of sinking, or essential machinery such as the main Engines and generators are in danger of being submerged, it is permitted to pump bilges directly overboard using the Fire & Bilge Pumps, but this must only be done with the permission of the Chief Engineer and Master and it must be recorded in the Oil record Book. If you have mostly water in your collecting tank, but are having problems processing it, try putting a cup or two of bleach into the tank, and wait a few days before processing. Bleach will kill the organic growth and make it easier for OCM to be accurate. All users of OWS equipment should read & understand the maker�s instruction Manual, and the relevant parts of MarPol, and the relevant company's guidelines (in SMS system) before using this equipment. 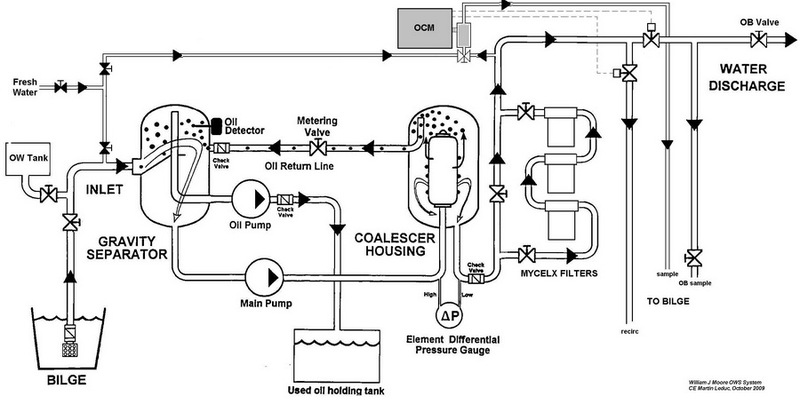 Users should also fully understand the piping arrangements. Inform the Officer of the Watch (OOW) on the Bridge of the intention to use the OWS. Ensure that the vessel is under way, on a voyage from one location to another and that the vessel is not in the Arctic special Area. Obtain the ship's position from the OOW and record it, with the time. Sound relevant tanks (bilge, holding, waste oil) and record the volumes. Turn on power supply, control air, fresh water supply. Prime unit by opening various vents, and filling and purging using clean water. Clean OCM using supplied brush, and flush unit with clean water; assure it reads "zero". Some OCM have an offset feature; assure this is set to "zero" when running on clean water. Run OWS to bilge with clean water or back to holding tank, if able; observe three way valve operation and delays. Observe OCM alarm function, light and audible. Close and lock overboard valve. Inform the Bridge O.O.W that Bilge pumping has been completed, obtain the ship�s position, and record it, with the time. Complete the OIL Record Book entry. Over the years, I have created numerous ship specific operating procedure for using the OWS, here is one sample. Most MarPol prosecutions are based on the presumption that that oil has been discharge overboard illegally, but it is very difficult to prove this. As a consequence, authorities frequently prosecuted on the ORB record keeping aspect. In other words, improper record keeping used in covering illegal discharge, is used to ascertain illegal discharges. So pay attention when filling out the ORB, what appears to you to be a simple mistake could be the subject of intense scrutiny. Be accurate. All the required instructions in filling out the ORB are provided right in the front pages of the record book. Read these instructions and understand them, provide the exact details demanded. Don't add extra details, don't create new numbers for entries; just do what they want, no more, no less. Numerous agencies provide guidance on how and when to fill out the ORB. In particular a template of typical entries is handy to have attached to the ORB. When landing waste ashore, receipts of these transactions should be kept in, or close to the ORB for scrutiny by officials. Use numbered seals everywhere, and record their use promptly. I.E. "seal xxxx, on ballast OB taken off for monthly valve testing, new xxxx applied, signed, dated"
TAKE IMMEDIATE REMEDIAL ACTION TO CONTAIN FLOW FROM WHATEVER SOURCE AND BY THE MOST EFFECTIVE MEANS AVAILABLE, INCLUDING THE USE OF A BILGE INJECTION SUCTION. IN A FLOODING EMERGENCY, OIL POLLUTION REGULATIONS MAY BE IGNORED. The Engineer is to ensure that bilges are pumped out regularly within current MARPOL, Flag State Regulations and Company procedures. When necessary, bilges should be discharged to the bilge reception tank and overboard, through the oily water separator. 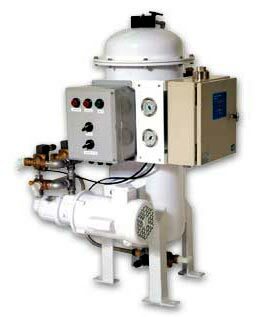 The Oily Water Separator is to be maintained as per Manufacturer's instructions and Company's PM system. Notices should be placed at point of operation with regard to current legislation as to operation and special areas. In all other cases, shore reception facilities must be used. Oily water separator discharge monitoring devices should not be tampered with and any defects reported to Operations department. You can have a look at Duck Notes #02 - The oil pollution prevention regs, although not based on current regulations, they are still very relevant to this page.